Curtain walling can be made from a range of materials, including glass, stone, or glass-reinforced concrete (GRC). In the case of glass curtain walling systems, there are two main types – unitised glass curtain wall panels and stick-built glass curtain wall. Unitised glass curtain walling involves the off-site manufacture of an aluminium-framed panel containing the glass, which can then be installed in one piece, using appropriate lifting equipment. Stick system curtain walls, on the other hand, are assembled on site, including the glass, which is usually installed in the frame using a glass vacuum lifter. Unitised curtain wall panels, especially, are designed to be fitted quickly and easily directly onto the outside of a building. Therefore, it makes sense that curtain wall lifting equipment should complement this objective and ensure panels can be installed quickly, safely and productively. 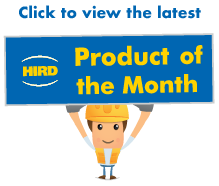 Hird provides three main curtain wall lifting solutions. A highly effective lifting methodology is to combine a mini crane with a vacuum lifter. 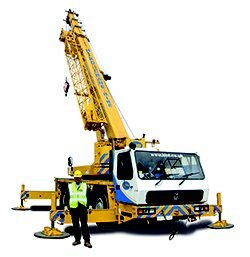 Mini cranes are designed to be compact, relatively light, yet powerful. This makes them ideal for use on construction sites, where space is limited. 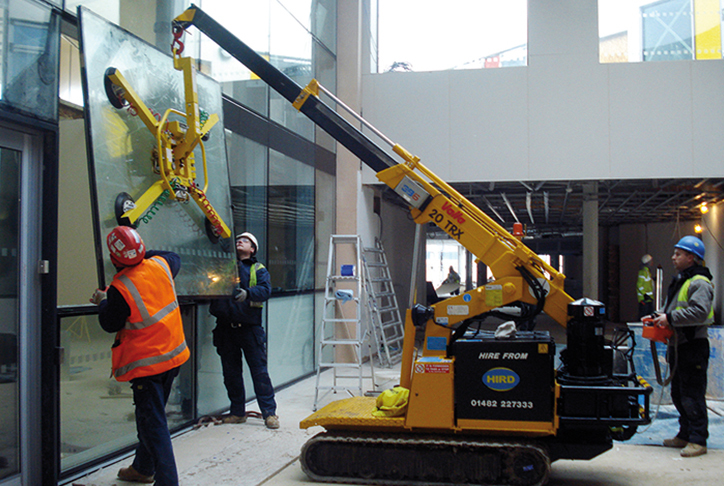 Two types of mini cranes are used to carry out curtain wall lifting. One is the pick and carry crane, the other is the tracked spider crane. Need help with curtain wall lifting? 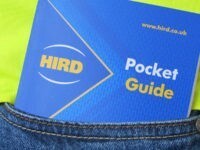 Hird’s Valla pick and carry crane hire fleet has machines with safe working loads that range from 2 tonnes to 25 tonnes. The cranes can, if necessary, carry a curtain walling panel from one location and take it to where it needs to be installed. 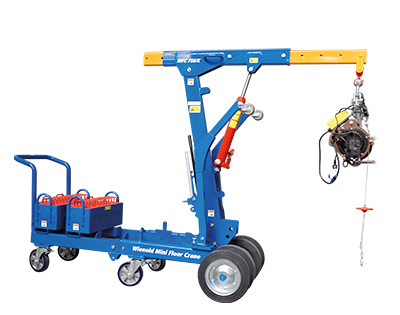 Valla pick and carry cranes are also designed to be extremely compact, and manoeuvrable, with zero set up time, which supports productivity. 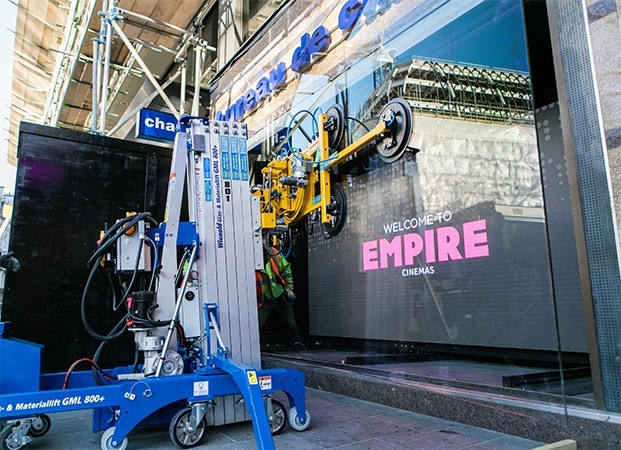 Hird’s fleet of Maeda tracked spider cranes are often used for curtain wall installation. They are designed to be extremely narrow when being transported. This, combined with their lightness, makes it easy for spider cranes to be taken to upper floors of tall buildings in construction lifts. 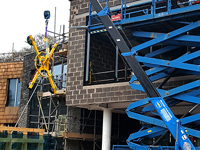 Spider cranes can then be set up on low load-bearing floors, as found in tall buildings, by deployment of their outriggers, ready to carry out curtain wall installation. Pick and carry cranes and spider cranes are combined with vacuum lifters which hold unitised curtain walling panels safety while they are installed with powerful suction cups. 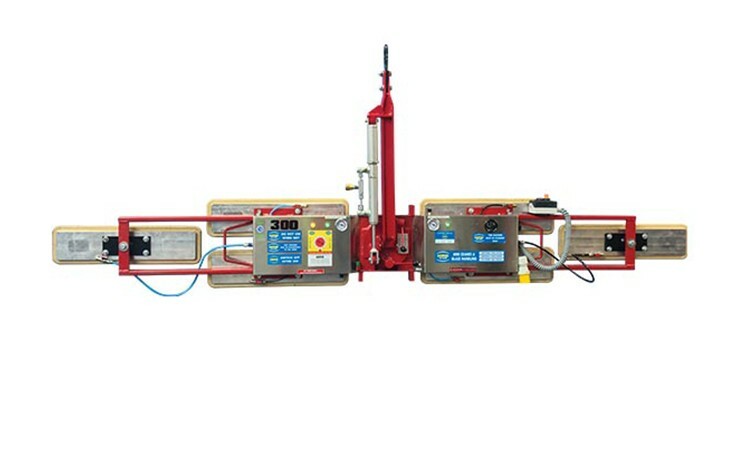 Hird provides a range of glass vacuum lifters and stone vacuum lifters for this purpose. Maximum loads range from the 135kg with the Woods Powr-Grip MT2 to 3500kg with the Kappel Hydraulica 3500, also known as Brutus. Stone vacuum lifters are designed with special suction cups for holding irregular surfaces, so they can lift both stone and GRC curtain wall panels. The Kappel DSKE2 stone vacuum lifter has a maximum load of 300kg (six cups) or 200kg (four cups). It can be adjusted to lift in-line for narrow loads or in square formation for wider loads. The Kappel Hydraulica 500 GRCS vacuum lifter can lift up to 500kg. It has electrical tilt (90 degrees) and rotation (270 degrees) for precision control and load placement and, like the DSKE2, remote control. 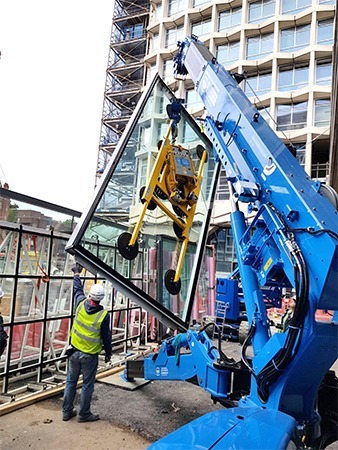 Winlet glazing robots, supplied by Hird, have transformed the way curtain wall panels are lifting and installed, dramatically increasing productivity and safe load handling. 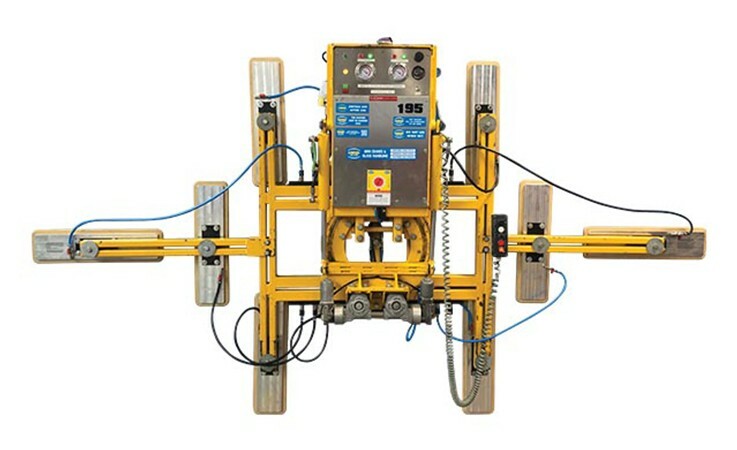 The robots have an industry-leading vacuum lifter manipulation system which holds the load in the same plane as it is moved either sideways or up and down. This means a unitised curtain wall panel can be held precisely in the right position to be installed as it is introduced to the panel aperture, greatly reducing the need for manual handling. This means, with a Winlet glazing robot, an installation team may only need two operatives instead of four or five with conventional curtain wall installation methods. Also, because of the ease with which the load can be controlled, the Winlet glazing robot can be used for inside out unitised curtain walling panel installation. 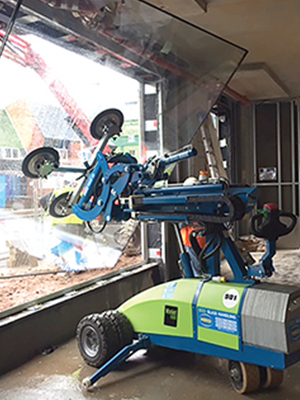 The glazing robot can now be fitted with specialist GRC or stone lifting vacuum cups and with attachments to allow the machines to lift mullioned unitised curtain walling panels. 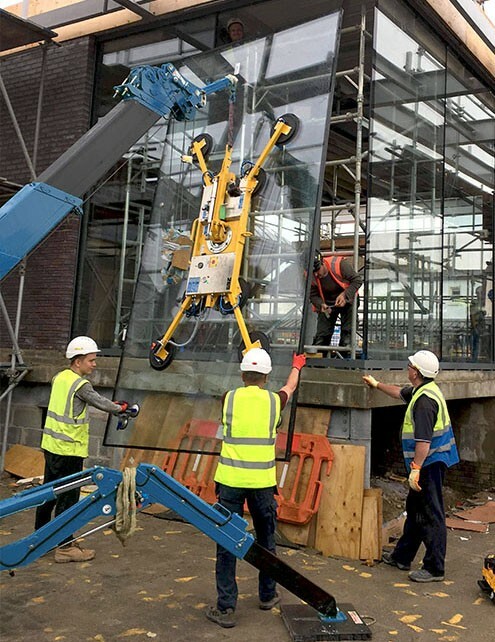 Hird can supply simpler but highly effective counterbalance floor cranes to support curtain wall installation. 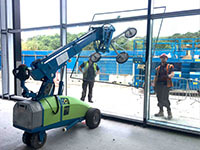 Wienold GML 800+ glazing manipulator – This machine, conceived by Hird, Kappel and Wienold, can lift loads of up to 500kg to a height of 7.9 metres, and install curtain wall panels directly overhead if necessary. Wienold MFC 750 K – another machine designed by Wienold with support from Hird. 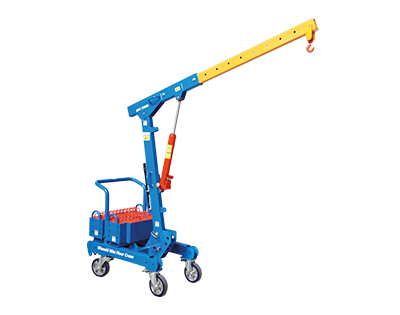 This is a mini floor crane that can lift has an ultra-compact footprint yet can lift loads up to 750kg. There is an even more compact version, the MFC 750 KS, known as Shorty, which can lift a maximum 500kg. Both versions are ideal for working in highly confined spaces, for example on roofs, for lifting and installing glass, stone or GRC panels. Whatever your needs for lifting curtain wall panels, Hird will have the right equipment to ensure it can be done as safely and as productively as possible. All equipment is available nationally from our three regional operational hubs. Accredited operator training is available, along with all lifting accessories and support services, including powered access hire.